This is my very first mascara review on my blog and boy am I excited to do it. 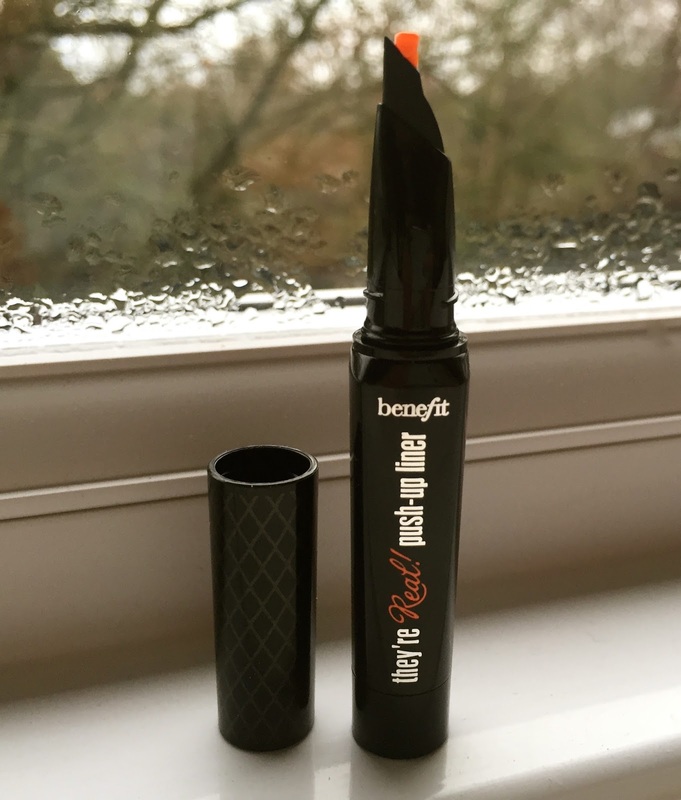 I couldn't have dreamt of a better mascara to review for the first time, this stuff is magic. I was lucky enough to visit a beautiful Sephora store in France during a short trip there (you can see the post here), and I found this amazing deal for just €25! 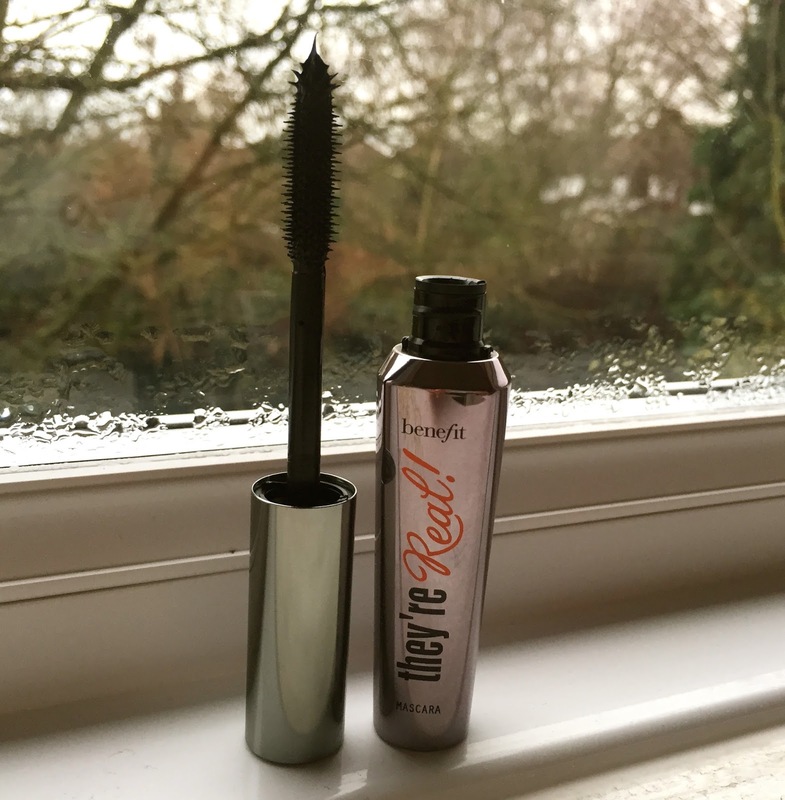 The package is known as the 'Real Steal' and contains the infamous 'They're Real' Mascara, the 'Push-Up' Liner along with a handy eye makeup remover too. What a steal! As far as I know this set is available in all major beauty stores and the price doesn't really fluctuate. So lets get on to the review! First impressions: the packaging is beautiful, I love the metallic look and feel, it kind of gives you the impression that it's going to produce a sleek, perfect finish. The brush itself is sturdy, short and has lots of bristles for a thorough job. Pros: I honestly couldn't believe my eyes when I saw my lashes after only lightly applying one layer of mascara. It was so easy to use and provides beautifully bold, elongated lashes. Trust me, if you thought you didn't have long enough lashes before, you will be very shocked when you see them with this stuff on. With a second layer the lashes are even more emphasised and are still bold and separate, defintely not clumpy or spidery. If you like spider lashes, a good 3 or 4 layers should do the trick. That's how versatile this stuff is. As for wear throughout the day, lets just say you can leave this stuff at home; you don't have to worry about smudging, flaking or just wearing away, it stays on until you take it off. Cons: I really don't have any qualms with this product at all, it does everything you'd want a mascara to do and so much more. The only thing I'd say needs a slight improvement is the ease of taking it off. Of course they provide you with remover, but when that runs out it's all down to your cleanser and a flannel. Things can get a little messy, so I think they should either provide more remover or make it easier and less messy to remove. Other than that, the pros heavily out way this one minor con. 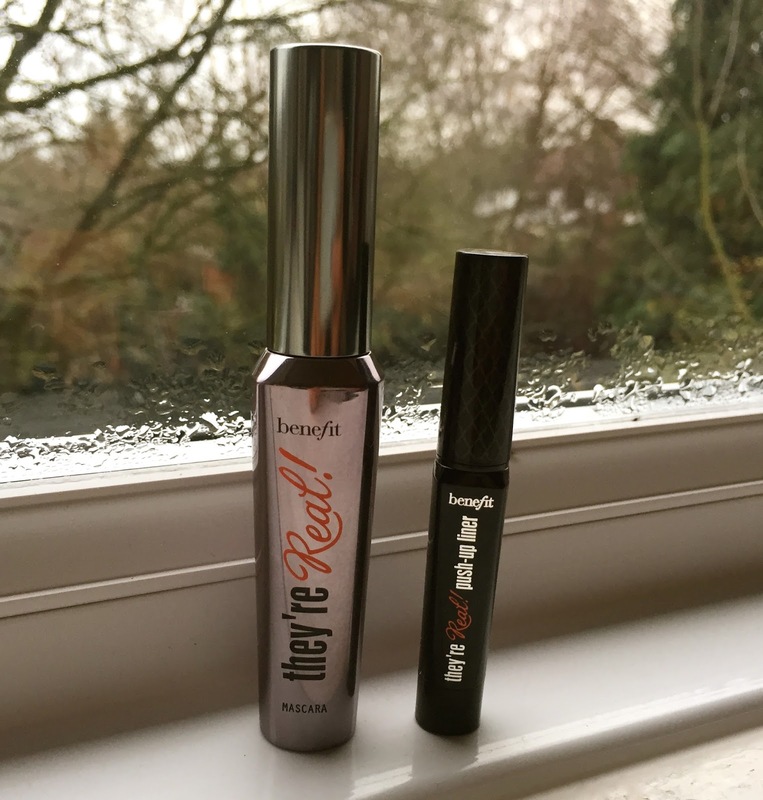 The 'Real Steal' package provides you with a full sized 'They're Real' Mascara and a mini 'Push-up' Liner for you try along side it. The 'Push-up' liner is a gel based liner which is basically a slightly drier version of liquid eye liner, so for those of you used to liquid eye liners, this is a little different. Pros: Once you've perfected the art of using this stuff (it's not as hard as it sounds), then it's so simple to use and get great results. It's long lasting and stays bold throughout the day, much like the mascara. It's brilliant for a number of different tricks and flicks, so go wild and find the style you love. I really like a simple flick with a medium coat of mascara to top it all off. It's just splendid. Cons: As I said, getting to grips with using the product can be quite tricky, so you've just got to be patient and keep trying, I promise you'll get the knack in no time (because once you do, it looks stunning). Also, as with most gel liners, it can be slightly annoying if you accidentally go over a bit you've already coated, but with practise that happens less and less. 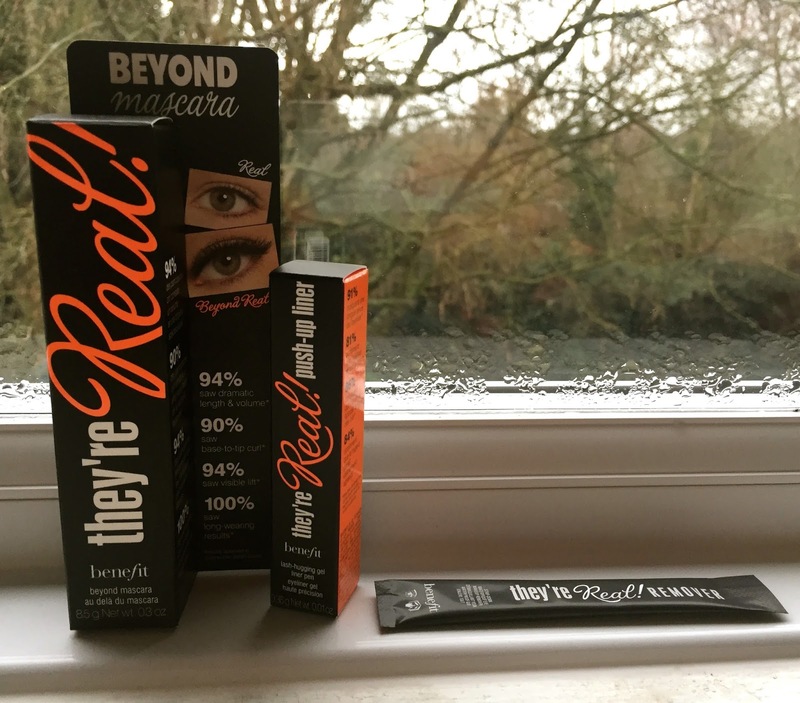 Ever tried the Benefit 'They're Real' collection? Let me know your thoughts in the comments below. What's your favourite mascara or eye liner? Get the Benefit They're Real Set here.